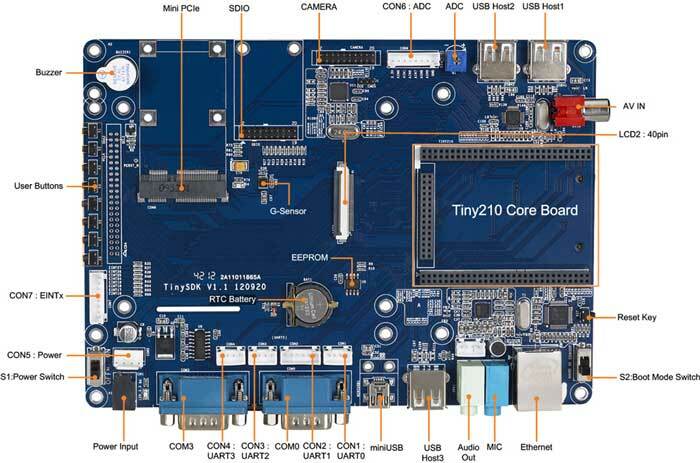 The Tiny210 Linux/Android System is a high-performance design based on the Samsung S5PV210 ARM Cortex-A8 microcontroller with 512MByte DDR2 RAM, 512MB Nand Flash, RTC, Audio and Ethernet capability. The system consists of a motherboard with the Tiny210 CPU module plugged into it, and an LCD touchscreen module mounted (three sizes available). The motherboard has integrated RS232, USB, Ethernet, Audio In/Out, Keyboard, LCD, HDMI, TV out, camera in, SDIO WiFi Module (pins only), SD card (pins only) and more other functions on board. A complete software development package is included. The board supports Linux 2.6.35, WinCE 6, Android 4.0 and Android 2.3 operating system and is provided with complete basic drivers. .
We provide one mother board for Tiny210 CPU board. 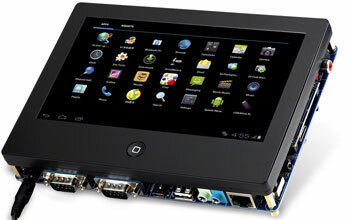 One is for Tiny210SDK mother board, it have more expand fundtion, such as 4 USB Host, and so on. CoreWind also offers customer design service based on the Tiny210-S5PV210 board according to customer’s requirement. Whether you need to reduce, add or modify to existing hardware, CoreWind will help customers with expert competence and rich experience.